Pima County is working to implement a Pay for Success (PFS) program in Arizona and will lead the way among Arizona jurisdictions by continuously looking for innovative approaches to address social problems without placing financial burden on the taxpayer. Pima County in partnership with the University of Utah’s Sorenson Impact Center have teamed up with the academic research institution to design a PFS program to be utilized over the course of 5 years with an expected launch of June 2018. In June 2016 Pima County and the University of Utah’s Sorenson Impact Center received $1.3 million dollars from the Department of Housing and Urban Development and the Department of Justice, (HUD-DOJ), to address homeless recidivism in Pima County. Pima County will also be seeking support from non-government investors and non-profit service providers to set distinct, predetermined goals to be reached. 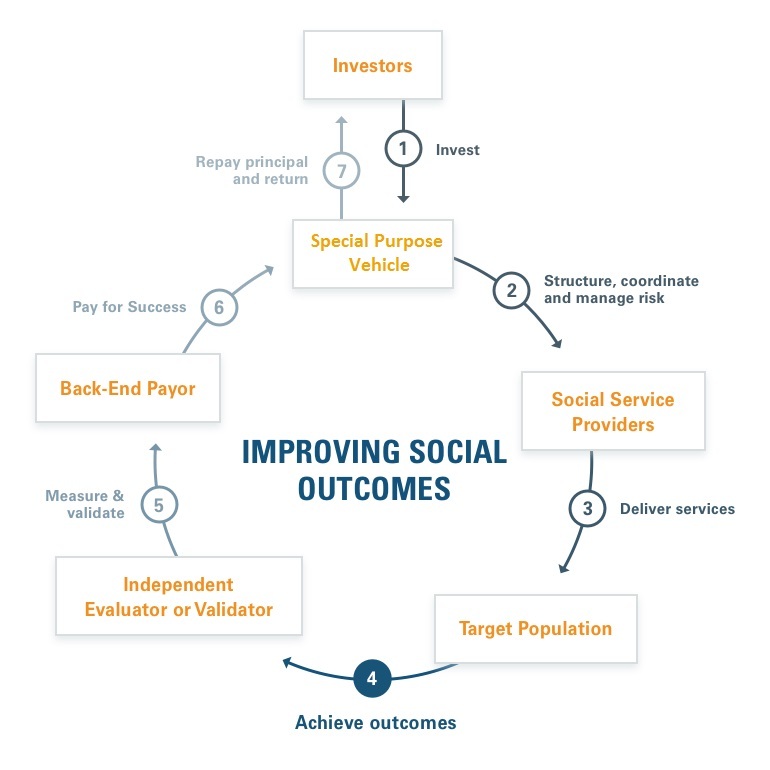 Pay for Success, also known as Social Impact Bonds, is a social funding mechanism that allows local government agencies to identify a social problem that cannot be comprehensively addressed by either, using in-house services, or budgetary constraints. The PFS model stimulates the local economy by bringing in investment money for local service delivery to local residents. A Knowledge Intermediary operates the project and works with the local government to identify the social issue, raise funding via Investors, select a capable Service Provider, and engage an independent Evaluator. An Investor, private or non-profit, can fund a piece or the entire project and receive an agreed upon return if the program is successful. If the project is not successful in addressing the social issue then no reimbursement is made. A Service Provider will be contracted to delivery services to the target population using the investors funding. Final success payments will be made if and when an independent third party Evaluator reviews the project and determines if agreed upon deliverables were met. The process of understanding the Pay for Success model in Pima County started in 2014 when attending a Federal Reserve conference and being introduced to the new social funding. From the initial introduction Pima County has engaged with the Kresge Foundation, Tucson Electric Power, University of Utah Sorenson Impact Center and many others to identify a PFS project. These efforts led to a partnership with The Sorenson Impact Center focusing on reducing Homeless Recidivism. In 2015, Pima County in conjunction with the Sorenson Impact Center completed a landscape scan of the current homeless count, services provided for this population, shelter and housing access, and organizations that work in the field. This lead to the application submission in June 2016, in partnership with Sorenson, to the Housing and Urban Development grant Request for Proposal regarding homeless recidivist with mental health issues. In July 2016 the grant application was successful and $1.3 million was awarded to implement a pay for success program in Pima County. The Sorenson Impact Center, located within the University of Utah’s David Eccles School of Business, is an academic institution dedicated to developing cutting-edge approaches to solve complex social problems. The Sorenson Impact Center specializes in facilitating data-driven approaches to social service provision, including Pay for Success initiatives, which direct public and private investments to high quality, evidence-based programs that measurably improve the health and well-being of at-risk individuals. The Sorenson Impact Center serves as the Project Intermediary for Pima County’s HUD-DOJ Pay for Success project, providing expert guidance on project design and implementation. The identified target population set out by the grant is homeless recidivists who have mental health issues. This population has traditionally been neglected and difficult to address because of the inconsistency of living arrangements and disinterest of interacting law enforcement. Homeless individuals frequently interact with emergency services, county services, law enforcement and others. The societal cost related to services provided to this target population is a burden that is passed onto the both the organizations doing this work and the residents of the area by way of taxes related to the city and county services. The County PFS program will incorporate two evidence-based practices: “Housing First” Permanent Supportive Housing (HFPSH) with the Forensic Assertive Community Treatment (FACT), an intensive outpatient treatment model that improves health outcomes for people with severe mental illness who are most vulnerable to homelessness and hospitalizations. The PFS program also builds on other innovations and successes within Pima County, including the following programs and services, Drug Treatment Alternative to Prison Program (DTAP) in 2009, the construction of the Crisis Response Center and Behavioral Health Pavilion in 2011, the MacArthur Foundation Safety and Justice Challenge Grant in 2015, the Justice Health Information Data Exchange; the Justice Coordinating Council; and a current initiative to coordinate and expand Pretrial Services. The Evaluator's role in the PFS model is to audit the program to guarantee that the goals agreed upon by the investor and Pima County have been reached by the service provider. If the goals are reached then Pima County will pay back initial investments along with agreed upon returns. As of now the investor, evaluator and service provider have yet to be selected. This page will have information related to the Request for Proposals for the Evaluator. If you would like to be notified when the RFP is live please leave your information below. The Service Providers role in the PFS model is to create a proposal for permanent support housing with wrap around services for individuals with mental health issues. The steering committee will select the Service Provider once the application window has closed. This page will have information related to the Request for Proposals for the Service Provider. If you would like to be notified when the RFP is live please leave your information below. The Investors role in the PFS model is to be the fund provider by investing in a service provider to offer permanent support housing with wrap around services for individuals with mental health issues. The steering committee will select the Investors once the application window has closed. This page will have information related to the Request for Proposals for the Investors. Please leave your information below.